LOMA LINDA, Calif. --- Recognizing the big bucks to be made in ultra-niche online dating dating sites, Loma Linda centenarian Edith Greenely has taken a break from her day job of self-defense instruction to build an online dating platform called TarryNot. She calls the online dating hub "a reputable place where centenarian vegetarians otherwise known as Seventh-day Adventist, can meet their special friend." Greenely said she got the idea for TarryNot from her great-great-great-grandson who kept complaining that there was no one for him on AdventistMatch. "I told him that if he was having trouble meeting Adventists online, I was a goner. I had to build something for folks in my league." The 112-year-old quickly went about finding another tech-savvy family member to set up the site and run free trials with local centenarian Adventists. Satisfied that TarryNot worked, Greenley launched it for general membership. She has only one strict rule for members: "Only upload current pictures of yourself. No sneaking in younger pics from your 90s. That's not playing fair." Where single Adventists meet. Free 2-year membership. Divorced, widowed and never married welcome. Helping Adventists to marry Adventists. Thanks for letting us know..
Yo, Sista Edith, I’m just a few years shy of 100. What are my chances? If you got lots of money stashed away, please advise. The gal who hooks up with me MUST move over here to the east coast-NY to FLA. I don’t eat tofu. I love Little Debbies. I dislike potluck dinners after church. I know my 28 SDA fundamentals forwards & backwards. I am good at name dropping all my contacts high up in the GC. I drive a fast car-2006 Mercury Marquis. I have 20/20 vision in one eye. I have selective hearing. All of a sudden, I can’t remember all the attributes I have. Let’s go to Starbucks soon!! Yo, Richard: forget Edith! What about me??? Remember we were “nursing home sweethearts”? Or are you too senile to remember? Yo, Millie-What? Me Worry? I forgot why I came to this site!! I’d love to mingle with a centenarian or an advanced G. I learnt they’re caring and more passionate with love. “Only upload current pictures of yourself. No sneaking in younger pics from your 90s. That’s not playing fair.” Well, it looks to me that Edith herself slipped in the above photo from her 90’s. She looks younger than in the 2014 story about thwarting the mugger. Edith better play by her own rules. And she better hurry or she won’t have time to meet anyone on her TarryNot site. “For yet a little while, and He that shall come will come, and will not tarry.” Hebrews 10:37. BUSTED! 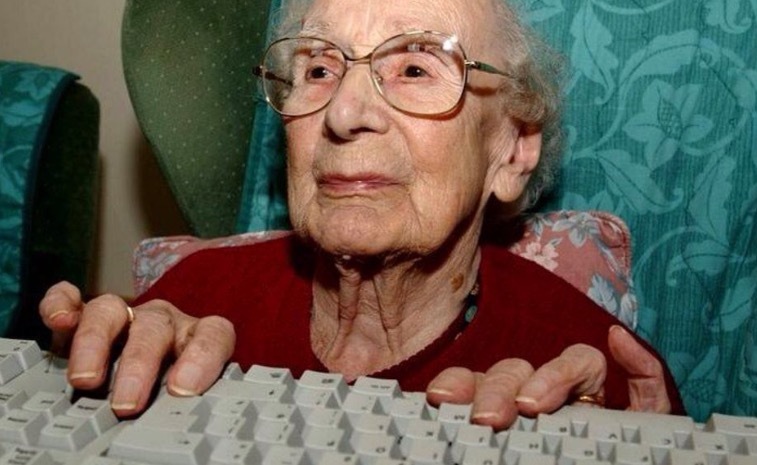 Edith says she was 99 when this pic was taken… Is asking for some understanding..
Edith, don’t quit your day job. The dating business is not all it’s cracked up to be. Some of the profiles are fake, and all of the good ones are fake or already died. It’s a zero-sum game. Stick with real people in real life. Maybe some bald, wrinkled, decrepit, cute old geezer in your self-defense class would do. Regarding yesterday’s story about a boxing match between Manny Pacquaio and Ted Wilson: move over Manny. Let’s see Edith Greenely vs. Teddy Wilson. That would be the Fight of the Century. More fun than a barrel of clowns, more dangerous than a rattlesnake, more violent than a Donald Tramp rally, and more exciting than a roller-coaster ride on the Great Wall of Mexico. Go Edith!